Chatbots are all the hype these days. You can use chatbots to stay updated with current events, order a ride sharing vehicle, or even schedule an appointment. But have you ever considered building your own chatbot? In this guide, I'll teach you how to create a location-aware chatbot with HERE Location Services and Twilio using Node.js. The chatbot will enable users to search for places near a location. For example, a user could search for "Sandwiches near Central Park New York City" or "Subway near 701 Pike Street Seattle." That's both places and addresses you can search for! If you get lost during the Twilio setup, give this helpful guide a read. We're also going to need to install ngrok to run a tunnel providing an externally available URL to our server. Don't forget to paste your HERE and Twilio API credentials into their respective fields. We'll want to configure our server to reply to messages sent to our Twilio phone number. Once Twilio is configured correctly, the above code will enable our bot to reply with 'Hello, there!' anytime you text your Twilio phone number. To get the server up and running, you're going to want to run node server.js in the command line. In order to make your server publicly accessible, you'll want to run the command ngrok http 1337 (on macOS a quick way to do this is to run these two commands on different tabs). Port 1337 is now exposed to the public internet. Copy the forwarding URL (highlighted in the below screenshot) provided by the ngrok console. Take the copied URL and configure it as a webhook for your phone number. Under the Messaging header, paste this URL followed by /sms in the message comes in field. Now that you've got a functional SMS messaging service, let's make this chatbot location-aware by equipping it with HERE Location Services. Let's break down the above code. The variable incoming is the plain text sent by the user to the chatbot. We can split this variable into two parts by using incoming.split(' near '). This by no means is the best way to parse text, but we'll do it this way for simplicity's sake. Once we've received our reply for the API, we can extract the latitude and longitude from the response. Be sure to place the remaining code examples all within the request.get() block. Now that we've transformed our location string into coordinates, we can start searching for places that fit the constraint of the search query and location. To do so, we're going to construct a HERE Places API search (within the geocode request). I'd like to return 3 results to the user each time, but sometimes there aren't always 3 results available for a particular query, so I created the variable resultAmount to show the appropriate amount of available results. Let's start processing the results from our API response and begin preparing our reply to the user. responseMessage sets up the first line of our reply message to the user: Here are the 3 closest Mexican restaurants to 701 Pike Street Seattle. Sometimes the Places API returns subcategories of the search query, not actual places. To avoid and filter out subcategory results, we can add a simple conditional blocking subcategory results. In the event we do come across a subcategory instead of a place, we increment resultAmount to ensure we return the appropriate amount of results (usually 3). 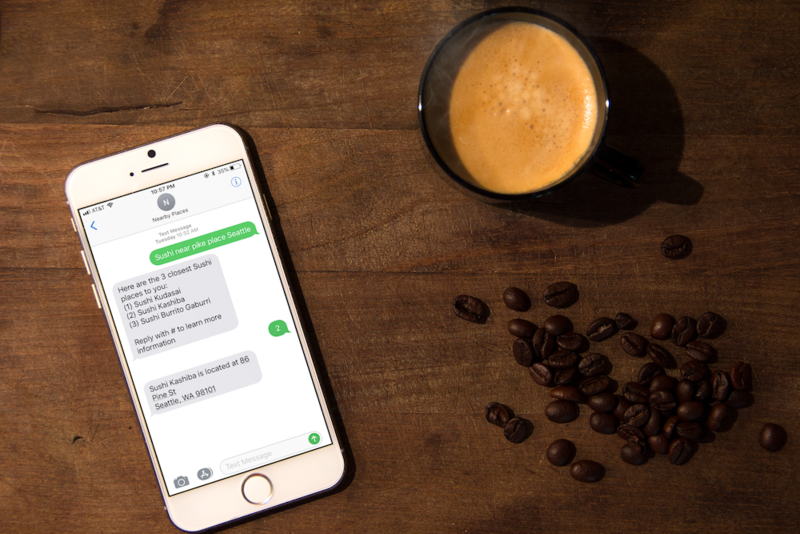 Now that we've created both our dictionary of places and our text reply to the user, let's go ahead and send something via SMS. Voila! The user is now sent a list of results relevant to their search query and location! Give it a try with "Sushi near Pike Place Seattle"
The if (incoming.length > 1) is designed to accept the user's first message. The initial message to begin the process must contain a search query, the word 'near', and a location string. This will be longer than one character. The else if (places.length > 0 && incoming.length == 1) is designed to accept the user's second message. We check to make sure that the places dictionary is empty and that their incoming message is only one digit in length (the second message is supposed to be an integer between 1 and 3). There are plenty of additional ways to check this case, but we'll stick with these conditions. We're now able to send the address to the user about the requested place. To ensure messages that don't follow the strict 'near' format don't crash our service, let's add some error handling. This ensures the user's first message contains a 'near' so we're able to extract the search query and location string. In the event no places are returned from the Places API query, we send a message informing the user to try again. Congratulations, you've created a functioning location-aware chatbot! You can check out the full source code here. There's no need to stop here! We've created just a simple version of a location-aware chatbot. What additional features could you bring to this chatbot using HERE APIs? Try enhancing this project by giving our Traffic, Routing, Transit, Weather, and Positioning services a shot. Want to chat in person about HERE Location Services? You can find me at the Turkish Airlines Travel Hackathon on December 22-24 in Istanbul, Turkey! Update: Now you can watch this hands on tutorial on YouTube!